Discover interesting facts and information about the weapons, including the Shields, used by Native American Indian tribes. "...would glance off a rifle shot with perfect effect by being turned obliquely, which they do with great skill." Because the war shields were used on horseback they were small measuring 20-24 inches in diameter and light in weight, similar to those used by the Ancient Roman cavalry. The war shields were not meant to shield the body as such, they were mainly used as arrow deflectors but could also provide protection against the Spear of an enemy. 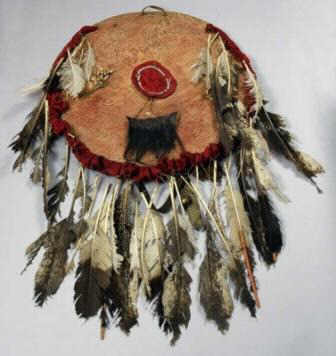 The circular, hide, war shield illustrated in the following picture measured 20 inches (50cm) in diameter and is edged with red flannel, with feathers, beads, fur and a piece of human scalp attached. The war shield belonged to a Comanche warrior and is believed to have been taken in a battle with the Osage tribe. Medicine Shields were sacred objects decorated with symbolic designs that reflected the personal vision and “medicine” or spirit-guided inherent power of Native American warriors. Medicine shields were not the kind that were used in battles - but every warrior had a medicine shield. He would not use this shield for protection during battles, however, he might still carry his medicine shield with him attaching it to his horse in order to gain spiritual protection. The medicine shields had specific spiritual meaning to each warrior and were created following the rite of passage called a Vision Quest. A Vision Quest was undertaken to seek and identify a Power Animal to help them as a spiritual guide to walk through different stages of life for the purpose of teaching and guiding them, and in some instances protecting them. Following the Vision Quest the young Indian would meet with the Medicine Man who would interpret his dreams and this interpretation would then be transferred onto the shield in the form of sacred symbols and depictions of the spirit guide. 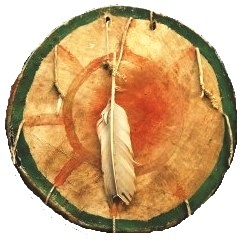 Medicine shields were typically made out of animal skin that was stretched over a wooden hoop. Pictures, emblems and symbols would be then painted on the Medicine shields. 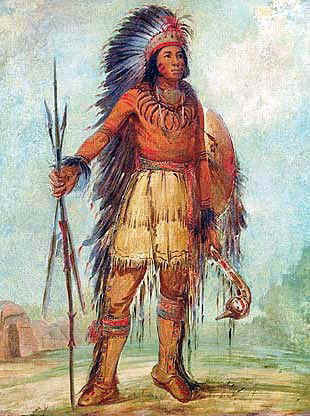 As the young warrior grew in stature additional objects reflecting his prowess as a warrior were added to the Medicine shield such as feathers and scalps. Native American Weapons - War Shields and Medicine Shields. Discover the interesting facts and information which relate to the History of Native Americans and the weapons they used such as the War Shields and Medicine Shields. The pictures on this site show the weapons and tools that were used by various Native Indian tribes that can be used as a really useful educational history resource for kids and children of all ages. All of the articles and pages can be accessed via the Native Indian Tribes Index - a great educational resource for kids providing an unusual insight into their culture. We hope you enjoy watching the videos - just click and play - a great resource for gaining facts and information about the life of Native American Indians.